MM Kembla recently asked RGC to develop an integrated range of marketing materials to celebrate their 100th anniversary working with the plumbing industry in Australia and overseas. We began by creating a unique “Quality, Reliability and Service” company insignia. The stamp celebrates their anniversary and the founding principles of Kembla copper; quality product, reliability and unrivalled customer service. The new QRS logo was implemented across all digital and print communication. Then we developed a special commemorative journal which was researched, designed, written and printed by RGC to honour MM Kembla’s rich history showing how important copper has been to the Australia'’s development and the changing shape of the plumbing and construction industries as Australian cities continue to grow. Staff and customers past and present also contributed their personal stories and photographs of there work experiences to bring MM Kembla’s history to life. We asked photographer Karl Schwerdtfeger to take engaging black and white portraits of key personnel who had worked for the company for more than 25 years. The final leatherette bound journal was produced in China and placed into a specially hand-crafted commemorative box lined with a sepia photo-montaged historical image. A limited edition copper pen ball point was also included. The box was presented to key customers who had helped to contribute MM Kembla’s business success over the last 100 years. 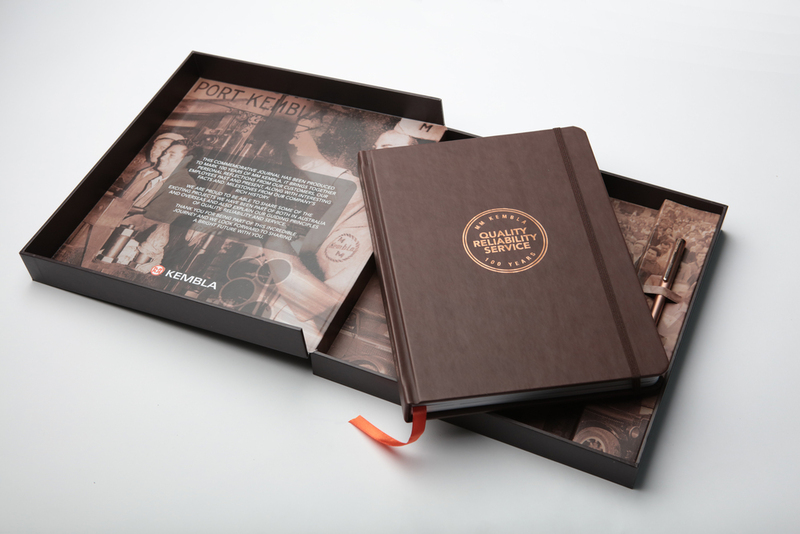 An exclusive orange version of the journal was also presented to employees at a special commemorative dinner.